This month I am going to discuss the importance of using short branch titles in your MindGenius maps. Without them, many significant benefits of your MindGenius maps will be lost. We've all cringed at PowerPoint presentations which are full of large blocks of text instead of bullet points. Especially when the presenter just reads the slide verbatim, adding no apparent value to what has being visually presented. Yet many people fall into the same trap when they create their MindGenius maps. They put in swathes of text into their branch titles and do not recognise that they have significantly reduced the effectiveness of the maps they have produced. 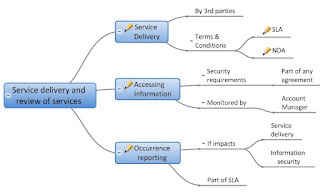 When people look at a map which has large amounts of text in the branch title they find it difficult to identify the key messages that are contained within the information presented. All the glue words that we use in verbal communication seem to hinder, rather than help, in the visual communication medium. The highlighter pen businesses profit greatly from this. The inherent structure of the information is not readily apparent which hinders understanding. You have to mentally discard the glue words to identify and understand the structure, instead of your eyes communicating the structure directly to your brain. This significantly slows down the rate of understanding the content of your map. In extreme cases, your map can appear unappealing to the eye. It is not memorable, just a series of large text blobs. A side effect of long branch titles is that it flattens the map structure shown in your Map Explorer and makes navigation through your map to find and view specific content much more difficult. There are significant drawbacks in using branches with large amounts of text. Keep your branch titles short and to the point. Easy to say, but it is not necessarily easy to do. There is always the temptation to add another word to make the branch title less ambiguous. However, before you know it you are creeping back towards the swathes of text scenario. The secret is in knowing when to stop. Keeping your MindGenius branch titles short and to the point requires self-discipline but it does become easier with practice. Here’s how I do it. I reduce the information I wish to communicate to its essentials by identifying the key words (e.g. nouns, verbs) or phrases by mentally highlighting them. I then create the structure of the information using parent/child branches structures. I don’t worry about losing the 'detail' or the 'finer nuances' of the information that are contained in the richness of our language. If needs be, I can put the grammatically correct representation of the information in the notes associated with the branch. The Note icon indicates to the reader that more information is available if they require it. • Create a dummy parent branch,[e.g., type ‘A’ and hit return] and paste your wordy text into the branch note. • In the Notes Editor Highlight the key words in the block of text. 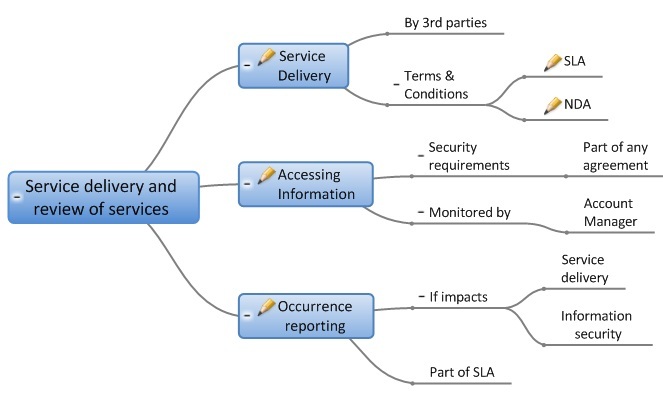 • Then put a meaningful summary title in the dummy branch title and create a child branch structure to reflect the key words. Now comes the big question. How short is short? What is the optimum number of words for a branch title? 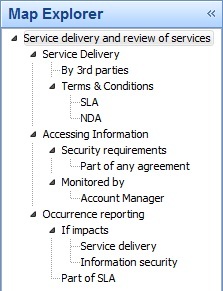 The mindmapping purists would say one word per branch title. I take a more pragmatic approach. I believe that the answer depends on the purpose of the map, its intended audience and the ramifications of the map’s information being misinterpreted. The shorter a branch title is, then the more ambiguous its meaning to a reader can become. You could say that ambiguity is the ally of creativity and the enemy of deployment. When you are seeking to be creative you do not wish to restrict the avenues of thought that people could pursue. If I was facilitating a brainstorming session then I would tend to use single word branches where possible in the idea generation phase. 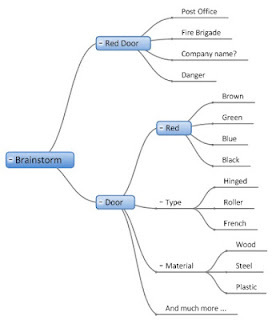 If I made the branch title ‘red door’ then the brainstorming participants may limit their thoughts to scenarios with red doors. If instead I made the parent branch ‘door’ and it’s child branch ‘red’ then the brainstorming participants have a much wider range of avenues of thoughts to consider such as other colours, other traits of a door, etc. However if I was seeking to instruct someone on how I wish some procedure to be performed then I would want to ensure that they clearly understood what they had to do and that there was no room for misunderstanding. In such a case I would use a few words (up to five) words in the branch title to zero in on the specific aspect I wished to address and provide the detailed instructions in the note associated with the branch. I would also add some child branches to provide them with the key points associated with the detail. So my rule of thumb for branch length is one word for maps used to facilitate creativity and the development of ideas and up to five words for instructional maps, augmented by details in the branch notes if required. But remember, it is a rule of thumb. Don’t let it get in the way of your map being fit for the purpose you intend it for. So there you have it. 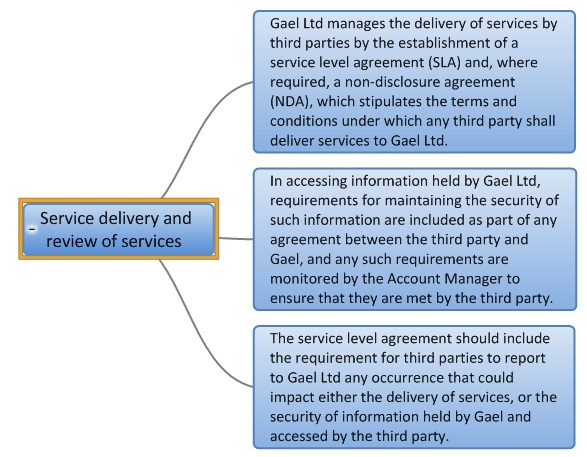 Keep your branch titles short and reap the immense benefits that MindGenius maps can give to you and your organisation. Visit the MindGenius site at www.mindgenius.com. Last month we published an interview with Jim Mather where Jim discussed his top business books. It proved to be a popular topic, so this month, Jim is explaining which book tops his list in biographies. How do you choose which biographies to read? Generally, I read biographies of people I admire or people, whose lives and experience indicates that I could learn from them. I recognise that sounds a bit worthy and boring - but the fact is if these factors are not present it is hard for me to keep my interest alive and read through to the end of the book: for they usually all have sad endings: the hero dies. What are your top ten biographies? What is your top book out of this and why? And the reason is that the book does something that doesn't always happen with biographies: it gives other supporting players proper credit for shaping events and shows the subject of the biography in a wider context. Including facing many problems that we ourselves face in managing relationships, other people and competing "truths". What is the most important thing you have learnt from this book? It underpins my firmly held belief that there is no such thing as the single, lone hero who makes everything right - but rather that any success needs many people working closely together with common goals, goodwill, trust, collaboration and mature means of handling inevitable conflicts. It reinforces the point that diversity and different people of different opinions are more likely to help create something that is innovative and resilient – than a pack of group-thinking yes men or women. Have you read any of these biographies? What would be your top book in this category? Visit the MindGenius website www.mindgenius.com. Jim Mather served as a Member of the Scottish Parliament from 2003 until 2011. In 2007, he was appointed Minister for Enterprise, Energy & Tourism: a role he served until he stepped down from front line politics last year. He started his career as a Chartered Accountant before moving to IBM in IT Sales & Marketing roles. Following IBM, Jim, and his fellow directors, successfully built and sold “Computers for Business”, a Scottish based reseller of leading computer brands. Last October Jim joined MindGenius’ sister company Gael Ltd as Chairman, and he is also a visiting Professor at The University of Strathclyde.